Revolution is a leading art and a science. It is our answer to the frequent question, "why has the popular uprising not happened yet?". Before going to war, you build an organizational infrastructure, and you devise how you will position your army in the battlefield. Whoever has had time to catch a better position before the battle begins, acquires an advantage against the enemy. The result of the battle will be largely judged by the preparations that were made by the revolutionary army many years ago, and not by the last-minute cries of onslaught. For the Revolutionary National Liberation Party, IERAKS, to prevail in battle with the enemy, it must forge daily in the consciousness of its members the following structural elements - basic materials for the subversive movement to be built. 1. The Idea. For it to be unassailable against enemy fire, it must be adamant. For it to make its adherents fearless in front of persecutions and dangers, it demands from the outset sacrifices for our ideals. Ideological debasement is prohibited, otherwise the temporary numerical gains made from such debasement would result in long-term quality loss. Our ideology is intolerant toward anti-Hellenic doctrines. It does not allow the coexistence with carcinomas. 2. Autonomy. Our purpose is on the one hand to reproduce Hellenism from early childhood, on the other hand, it's to disallow the diffusion of anti-Hellenism in society. In order to regain National Independence, we require autonomy in all fields. Networks of schools, hospitals, courts, police stations, banks, cultural centers, theological schools, which will be autonomous from the Judeo-Christian, Roman-like state. We view IER.A.K.S. as a Hellenic State in embryonic form. The recruitment of our followers will not be done for electioneering purposes. The accession into security corps separate from the security corps of the Romioi, the acquirement and manufacture of Hellenic weapon systems, the organization of exercise camps for our National Guardsmen, the recognition of the Hellenic Religion as an ethnarchic administrative authority, the authorship of a separate code of civil and criminal procedure, the creation of cultural diplomatic offices abroad which will be separate from those of the Romioi, and the organization of autonomous administrative authorities at each spot wherein Hellenes predominate the Romioi, will infuse into our adherents the necessary Spirit of Liberty and Independence that will regenerate Hellenism. We demand cultural, religious, legislative, economic, monetary, educational, judicial, police and administrative autonomy. 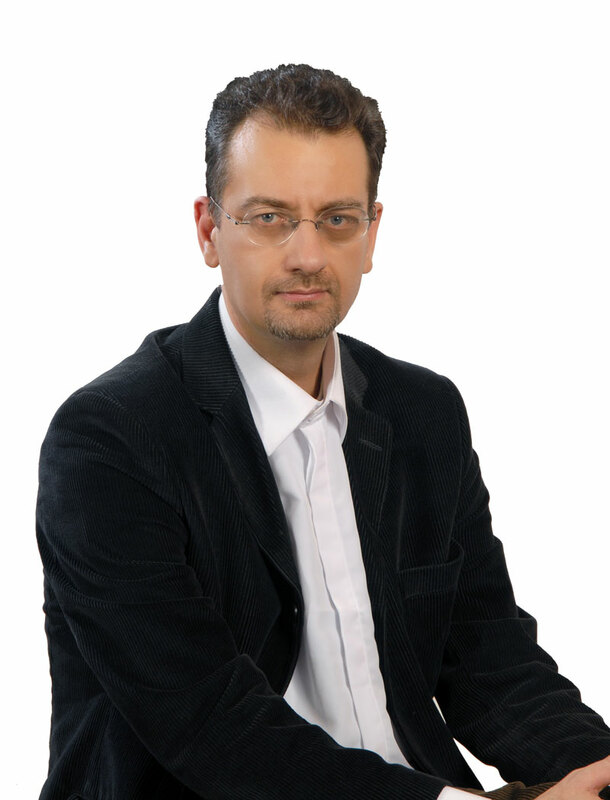 We will teach the Hellenes how to become responsible and active citizens. How to reproduce Hellenism. How to become guardians of the Greatness of our Ancient Ancestors. And we will achieve this only when we handle the matters that concern us. As long as we allow the Romioi to govern us, they will gradually wipe us out, in the name of "national unity". 3. Instinct of Imposition. A victorious revolution presupposes total dominance domestically and expansion abroad. Beneath the ideological surface, there must be a psychological substrate that pours forth energy that will fuel our expansionism. The instinct of imposition is the seed that subsequent generations of Hellenes will reap. The will to power will crush all the enemies of Hellenism. Without it, they will devour us. 4. Organizational culture. It constitutes one of the great disadvantages of contemporary Hellenism. 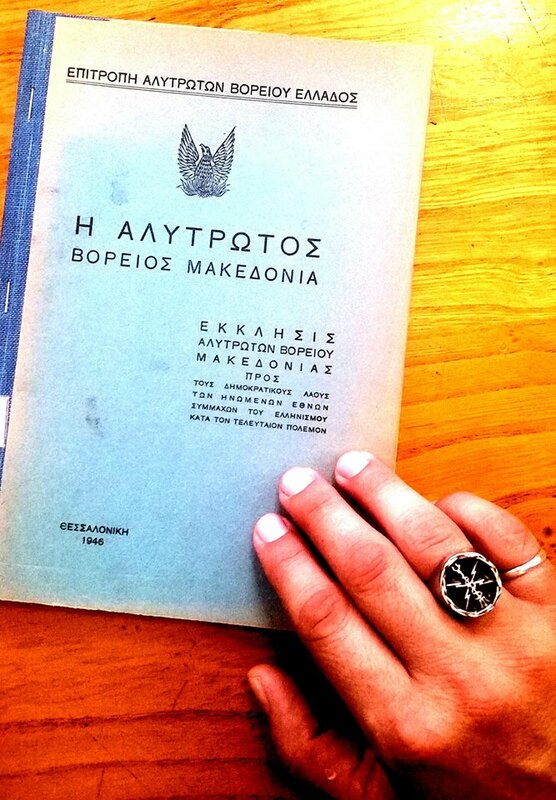 The organizational disposition is something that is taught daily, and is acquired with experience through industrial production, team sports, participation in war conflicts, mass political action, educational and cultural organization of the Hellenic Communities of the Diaspora, and through religious ceremonies of the Hellenic Religion. 5. Communicative supremacy. Many fellow fighters make the mistake of thinking that in order to prevail against the enemy, an occupation of the following is prerequired: television stations, newspapers, and other forms of mass media. While the possession of our own mass media is important for the Struggle, "communicative supremacy" nevertheless means something very different. We expropriate terms such as justice, law, terrorism, racism, anti-racism, violence, and we attach to them content that suits us. Never do we let the enemy give meaning to words. We change the association of words and meanings. We link images like Race with positively charged words like Liberty, so they can be recalled with a positive sign from the associative storage of the mind whenever we speak of Race and Liberty. We create mental constructs which our People copy when they express themselves. We always see to it that the resultant of the emotions in the mental construct is positive. When we want to say that the Hellenes transcend other peoples, we take care to make the wording imply that the peoples look forward to Hellenic thought on their own, we don't impose it on them. We impose our own cultural standards and our own moral codes, so that the political ideas take root in fertile ground. When the People daily express themselves on the basis of our own terminology and argumentation, then we have dominated communicatively. 6. School of intellectual leaders. For the revolutionary regime to be supported, it needs intellectuals who will lead. We need a school of officials, which must have a decades-long horizon. We must educate selected children from school age so they can emerge as leaders of Hellenism. With the use of the internet, we can operate Hellenic schools twenty-four hours a day. Online schools, in which Hellenic children will be educated from any point in the world they may reside, on the basis of the Hellenic paideia. The Revolutionary Movement needs many think-tanks that will supply our People with ideological equipment. 7. Militant priesthood of the Hellenic Religion. The National Liberation Struggle must feature leaders who will combine theological training and martial virtue. The Hellenic Priesthood must lead the Struggle. The West has no model leader to offer us. Contrariwise, the East offers models. Whether it's the Shaolin or the Taliban, they offer models of religious leaders who struggle in the front line of battle. 8. The economic circuit. Many fellow fighters are unemployed and find the excuse that the needs of livelihood do not permit them to totally devote themselves to the Struggle. We face this problem daily, and it must be solved by creating our own closed economic circuit of businesses that will employ fellow Hellenic fighters exclusively. We must simultaneously support in every way Hellenic products and Hellenic workers. 9. Professional officials. The collaborators and anti-Hellenic parties feature professional officials who are paid in order to destroy Hellenism. Historical experience has proved that the patriotic camp suffers from consistency and continuity in action. Even if a great patriotic rally were organized every month, it is not enough to topple the regime. The MAT (Units for the Reinstatement of Order) proved that organization, professionalism, training, discipline and hierarchy can defeat hundreds of thousands of unorganized, undisciplined and amateur citizens. Professional revolutionaries must work daily for the organization of the Revolution. They must supply the People with ideas. They must educate them and diffuse organizational culture among them. They must teach them techniques of revolutionary conflict in times of illegality. The revolutionary army must acquire specialization. One will deal with ideology, another with the internet, another with logistics, another with propaganda, another with organization, another with the internal security of the movement and counter-espionage, another with the collection of information from the enemy, another with finding funds for the Revolution, another with the education of members, another with interconnections abroad, another with cultural events, and another with social solidarity. 10. Embodiment of the Idea. For our ideas to animate the Movement, they must constitute models of daily conduct. The personalities of the Revolutionary Movement must fully embody the ideas so as to make our adherents emulate them. Leaders with deviant behavior will be instantly purged because they constitute a carcinoma. The embodiment of the idea can also be achieved through fiction. We must create heroic models that will constitute molds for the crystallization of the character of the young Hellenic generations. 11. International alliance. We face many enemies. The domestic enemy has formed alliances with foreign governments and coalitions. The Revolutionary Movement must immediately form alliances with foreign states, governments, coalitions, movements, organizations of every kind, which are well-disposed to our Struggle. The alliances will allow for the overthrowal of the balance of power which so far is to our detriment. We must organize frequent missions of delegations abroad for the search of alliances and material aid toward the Revolutionary Movement. We need political and religious recognition abroad. We must demand from foreign states their recognition of the Hellenic Religion abroad, and to grant it the status of a legal entity under public law. We must demand the recognition of a revolutionary government in exile. A national assembly must be formed abroad, which will comprise members of the Hellenic diaspora, and which will constitute the legislative body of the Hellenes who struggle to overthrow the occupational regime. At the same time, we must draw up survival plans of Hellenism, even for the event of a total collapse of the anti-Hellenic, Roman-like state. We must acquire statehood abroad, through land acquisition abroad, e.g. in Latin America or in Africa, so that we can house even five hundred thousand Hellenes. 12. Faith. The metaphysical interpretation of the many difficulties that the National Liberation Struggle will face, will solidify the faith in victory. The self-sacrifice among fellow fighters is a virtue that is cultivated only through faith in the Metaphysics of Hellenism. Few Hellenes, and for a short period of time, will be sacrificed for better wages. Many Hellenes, and for a long period of time, will sacrifice themselves so the authority of the Paternal Gods and Maternal Goddesses can be restored on Earth. 13. Strategic vision. For the citizens to rise up en masse, it is not enough for them to be vexed by the hunger and misfortune of the Memorandum. They must be collectively transported to the future, by means of their imagination. We must present to them in every one of our speeches our strategic vision for Hellenism after 50 to 100 years. We must engrave vividly in their imagination images from the future, utilizing words full of feeling and movement. For things that are difficult to be actualized immediately, we present them in the form of telefilms but with a future date. For example, the liberation of Ionia. We show a telefilm in which the Hellenic administrative authorities in Smyrna serve Hellenic citizens, so the eye and ear can become accustomed to such situations. For things that are easy to be actualized immediately, we present them in the form of street theater. For example, trials of collaborators. We set citizens to try actors who personate ministers of the memorandum, so as to stimulate the Hellenic soul in revolutionary action. We always take care to make the images that we project to the People appear many steps ahead of the current situation, so the Hellenic Soul can have motivation to move onward. If we show images of the current plight, we reproduce misery and ground the Hellenic Soul to a standstill. 14. Discipline. The Revolutionary Movement must radically change its conduct. Our adherents must be trained to comply with ideas and obligations. We are a political army, not anarcho-autonomists. Autonomy helps up to a certain point in keeping the movement intact after an arrest of a leader, but it destroys operational planning. 15. From the cradle to the grave. The Revolutionary Movement has an obligation to intervene in all spheres of social life and to leave nothing defenseless in the hands of the enemy. We incorporate and assimilate into the Party every social activity and power. We leave nothing unchecked. Unions, commerce, metaphysics, fashion, diet, public health, universities, security corps, economy, foreign policy, the Diaspora, environment, culture, legislation, nurseries and social networks are all fields of war in which we must intervene daily. The Hellene must feel our presence from his/her cradle to his/her grave. We do not allow any internationalist to grab even an inch of psychic territory. We do not allow any anti-Hellene to violate the ideological borders of Hellenism. We persecute him/her until physical elimination. 16. Deconstruction of the enemy's mental constructs. Our various enemies, here for centuries, before they kill us, deconstruct our ideological pillars: Nation, Hellenic Religion, Aristocracy, Hellenic Race, Ancient Hellenic Language, Hellenic Philosophy, Hellenic Art and Aesthetics, Enslaved Ancestral Lands, National Currency, Hellenic Industry. The great crime that previous patriots committed was that they never tried to deconstruct the ideological pillars of the enemy. We will not commit the same mistake. We hear naïve patriots repeat like parrots the nonsense that has destroyed Hellenism, "may every person believe in whatever he/she want to". We hear patriots, who either from cowardice, ignorance or inexperience, try to defend Hellenism through parliamentary structures, claiming that the problem is the persons and not the institutions. If the institutions fault them, they seek a better parliamentary regime, and not a complete overthrowal of the parliamentary plague. In this manner, they cannot carry the People along to an explosive Revolution that will sweep away everything in its path. The Revolutionary Movement must daily crush, humiliate, destroy and hate the institutions, values, manners and customs of the anti-Hellenes. We will daily deconstruct parliamentarism, liberalism, anti-racialism, anti-Hellenism, multiculturalism, monotheism, servility, European totalitarianism, the lustfulness for immigrants, cosmopolitanism and internationalism. We have a sacred war against the delusions that degenerate our People, and they are a great many. Constitutional, civil war, anti-war, europhilic, democratic, humanitarian and anti-racial delusions. 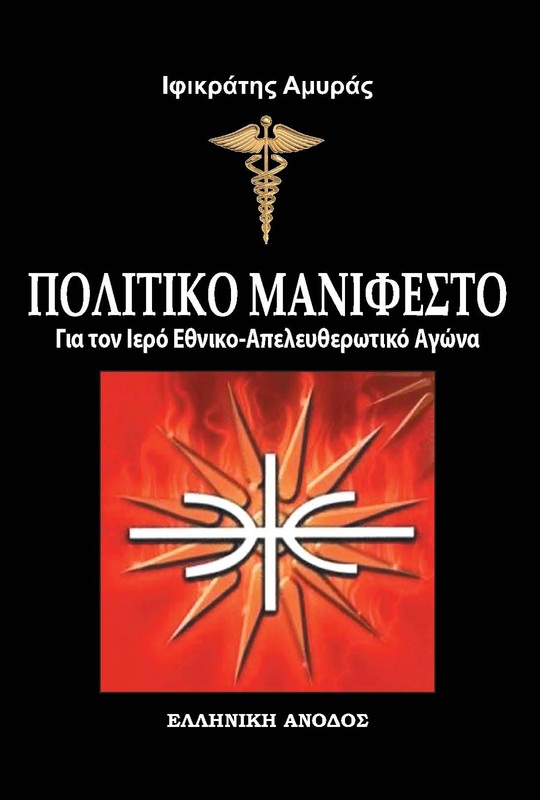 This Sacred War is a matter for all Hellenes, and must be guided by think-tanks with thousands of intellectuals and propagandists knowledgeable on psychology, advertising, journalism, politics, economy, history, sociology, ethnology, folklore, anthropology, military science, geopolitics, culture, philosophy and theology. 17. Reward-punishment mechanism. Perhaps the greatest flaw that the patriotic camp has, is the absence of a reward-punishment mechanism for the Hellenes' conduct. The existing unstable regime continues to survive not because of high intelligence, but because it rewards the corrupt with money, projection, and positions of authority, whereas patriots are punished with imprisonment, unemployment, and prosecutions. The Revolutionary Movement must activate reward-punishment mechanisms according to the phase of the Struggle and its organizational development. The punishment of the enemy must be emotional (defamation), historical (deconstruction of the enemy's historical personalities), ethical (rejection of the opponent's code of values), legal (prosecutions), economical (exclusion from job positions), and physical (elimination). The cheapest, safest and fastest punishment mechanism in the present phase of the Movement is character assassination. When we cannot physically eliminate a collaborating politician of the memorandum, we assassinate the character that he/she represents, by publishing stories in periodicals that describe the sleaze of such a slimy subject. In theaters, telefilms, advertisements, social networks, by the hour and minute, we exterminate his/her moral character. We photograph but do not name a specific politician. Let us label him MP Greetwell, or Minister Gofigureopoulos. What matters is that we deconstruct his structure of values. We must excite the people's passions, unharness the imagination as to how a traitor is punished when he falls to the hands of the People, exasperate the popular instincts of vengeance, rendering this character detestable in the public opinion. Rewarding is achieved in the form of the promotion of moral standards, politicians, and artists. Writing stories wherein our own models and our own code of values are idolized by the People. Awards, projection, solidarity and financial support are some of the mechanisms that help the People comprehend what is good and what is bad. Without our own reward-punishment mechanism, the People will be rewarded or punished on the basis of the enemy's code of values. And they will form their conduct on the basis of the enemy's will. 18. Legal and moral code. The Revolutionary Movement is not going to make headway if it does not start to draw up its own legal and moral code. It is not by chance that the Islamic guerrilla groups have cohesion, for they try to impose Sharia wherever they predominate. It is inconceivable to win the National Liberation Struggle when you do not have your own courts and your own penal code. Let us imagine that a prefecture of Hellas belonged entirely to Hellenes in faith. It would be tragicomic to regulate our lives on the basis of the legislation of the Judaic sect of the Nazarenes. It is criminal to wait until we take power in order to prepare our own legal codes. We must pave the way starting now, requiring from Hellenes in faith to frame the Hellenic civil and criminal procedure. 19. Horizontal and vertical differentiation. In order to survive as Hellenes, we must have the instinctive sense that we differ from other peoples. This is the greatest problem of contemporary Hellenism. It has lost its sense of differentness and uniqueness. When we accept that we are different from other peoples, then we will struggle daily to preserve our cultural and biological distinctiveness. Horizontal differentiation from other peoples ensures our biological and cultural identity. Vertical differentiation ensures our superiority over other peoples, and the victory in the struggle for national survival. Those Hellenes who are slaves to monotheistic sects, remain in the lower strata of society. Only the distinction of the Ancestral Gods is that which enchants and exalts. Only the seal of the Ancestral Gods renders them separate from other peoples and cultures. 20. Network. The Revolutionary Party must be ready to face a prolonged state of illegality, even lasting decades. The two organizational forms that have been embraced by many patriotic organizations, the vertical monolithic hierarchy and the horizontal leaderless organization, do not achieve the desired result. For different reasons pertaining to each. The vertical form can be easily decapitated, or the leadership easily corrupts. The horizontal form exhibits characteristics of indiscipline, a lack of coordination, disruptive tendencies, and is prone to endless debate and inactivity. The best organizational form is the hierarchical network. If needed, the leadership settles abroad when placed under illegal status, but the outlawed leading nucleus is surrounded by a network of legal organizations (cultural, educational, social, syndical, athletic, and others). The successful organizational form of the network is used by the Islamic guerrilla movement worldwide. There are leaders in every organization, and the members strictly obey the leaders, but the Islamic network does not have a vertical form. It bears a resemblance to the internet. Many nodal organizations join together and exchange information, combatants, forged documents, hideouts, funds, arms and training. Every charismatic figure emerges as an Emir, and is selected through proceedings of a war council as a supreme warlord to whom other leaders cede the last word. But they see to it that the leadership is dispersed throughout the world, and to recruit new officials so as to replenish the constant losses. 21. Self-contained political organization. We will not get tired of repeating that in politics 1+1 does not equal 2. It may equal zero. Collaborations of many movements with no ideological affinity, in the name of the salvation of the Fatherland, conclude in the Revolutionary Movement's incurrence of ideological decline, because these kinds of collaborations are always done on the basis of the lowest common denominator. And they usually conclude in an electoral collaboration. IER.A.K.S. has a centuries-long horizon, and not a horizon encompassing just the next elections. The self-contained political organization has as an objective the separation of the Hellenes from the Romioi, and to educate the Hellenes politically so they can seize power. For those "Hellenocentrists" who demand that we forget our ideological differences because foreign enemies are plotting against our Fatherland, we remind them that for thousands of years various enemies plot against Hellas. If each time we abandon the duty of defending Hellenism and taint our Struggle in order to ally ourselves with the Romioi, then we will never cure ourselves of the carcinoma of Judeo-Christianity. The members of IER.A.K.S. must acquire a party life and record their historical action. Only when they devote themselves with body and soul to the National Liberation Struggle, which could last for centuries, will our Descendants reap the fruits of Liberty. The members struggle for the elevation of the Party to an administrative authority of the Nation, and must therefore make their economic survival, security, projection, prestige, strength, dignity, pride, love life, education, identity and justice dependent on the Party. For only the Party identifies with all the expressions of Hellenism. Only the Party defends all the components of the Hellenic Nation. The members must seek justice through the Party. They must secure their livelihood through the Party. They must search for a mating partner through the Party. They must project their strength and prestige through the Party. All the members must be nurtured with the instinct of competing against rival parties, and that they will face difficult choices under pressure. 22. Agitprop Department. There can be no Revolutionary Movement without a department of specialized and devoted propagandists. The patriotic parties thus far have conducted themselves in an unacceptable manner regarding this matter as well. They were indifferent. They did not create departments staffed by specialists of propaganda. And later on they have the nerve to whine by blaming the Zionists, Freemasons, bankers, major television channel owners, and anyone else save for themselves. 23. Rewriting and interpretation of history. Historiography is the continuation of war by other means. Even if we are defeated in a military battle, we must write history in such a way as to morally crush the victors. Even after death. We must present the military defeats of the Hellenes by the Byzantines, Franks and Ottomans in such a way that we acquire the moral edge. Whoever controls the past, controls the future. We will rewrite the history of our People in such a way as to control their future conduct, which must be heroic, expansionary, solidary, and ethno-tribal. 24. Conspiration and vigilance. There are many manuals of guerrilla warfare, conspiratorial rules, espionage and counter-espionage. The Revolutionary Movement must utilize safety rules for communication, acquire its own network of informants from within the occupational regime, create entrance screening for new members, secure its databases from misappropriation, leave no trace when it commits "unlawful" actions that will give the occupier potential to identify fellow fighters, and frequently circulate information sheets with special techniques and scientific knowledge on subjects of fourth-generation warfare. 25. The virtuous cycle. The members of the Revolutionary Movement must acquire ideological, communicative, organizational, financial and educational preeminence against the enemies. Later on, the members recruit new members and the cycle starts from the beginning. The message of the National Liberation Struggle is imperative and obligatory: cultivation of the instincts of aggression and the martial virtues. We cultivate within fellow fighters the psychology of a privileged class and a hegemonic bearing. In order for the Hellenes to join the Revolutionary Movement, they must organize the daily Resistance, make their actions known, educate other members, secede from the occupational regime, daily forge the Hellenic differentness, and assemble in a self-contained revolutionary party. The equipment of the Revolutionary Movement is first carried out with feelings, ideas, laws, courts, vengeful wrath, strategic vision, change of the conceptual framework, historical spondylosis, economic substructure, interconnections abroad, a school of officials, faith, reward-punishment mechanisms, a political programme, etc., and thereafter with arms. 26. Who and how they set back the Revolutionary Movement. Some autonomous fighters, under the pretext of autonomy, are indifferent to the building of an organized, subversive movement against the occupational regime. Others registered in SY.RIZ.A. or Golden Dawn are indifferent to the political emancipation of the Hellenic Religion. Others do not want the Hellenic Religion to be included in the political imperatives of the National Liberation Struggle. Others do not have basic political training, but they constantly speak of direct democracy. Others do not have time or money for the Revolution. Others do not have organizational abilities. Others restrict themselves to activities in Nature (excursions, symposiums, etc.). Others do not appear in the mass media, resulting in the People not knowing the officials of the Movement. Others do not agree with the revolutionary violence of the National Liberation Struggle. Others, while they believe in the Ancestral Gods, do not want engagement in politics. Others, while they accept the Hellenic Religion, do not want to hear of a Hellenic Race. Others do not want to jeopardize anything for the Struggle. Others do not have an ideological orientation. Others have broken down psychologically by the surrounding social atmosphere. Others await another Alexander the Great as a leader, and only then they say they will fight. Others dream of coups d'état by a small group of military personnel. Others do not have basic dignity to separate from the monotheists. Others encage themselves in sophisms of the formula "let us not divide ourselves". Others allow the separatory left-right axis to reign over all other imperatives. Others await salvation from messiahs with American public bonds or Epsilon groups. Others are satisfied with the formation of a local, closed religious group which functions as a party of friends. Emasculated spiritually, they condemn the expansionary and hegemonic tendencies of Hellenism and the National Liberation Movement. Others perpetually slander fellow fighters with accusations of being agents, in order to conceal their cowardice and non-participation in the Struggle. If there are agents of the enemy among us, we identify them, punish them, and we continue the Struggle. We do not abandon the Struggle because of "agents" supposedly being everywhere. All movements deal with agents of the enemy in their camp. 27. The power of example. In order for the Revolutionary Movement to dominate, the Hellenes must be absolutely occupied by superior ideological, psychological, ethical and social perceptions. This demands the leaders of the Movement to be living examples of superior human beings. Only in this way will they daily infuse into the People the superiority of the Hellenic Religion, the superiority of Hellenic Ethics, and the preeminence of the Hellenic Nation. National Martyrs are needed. Only with the blood of the National Martyrs will the idea of the National Liberation Struggle come into being.